I was rooting in my cables drawer for something else and came across the power lead plug and boot I removed from my FT-857 last month Paul. Sure enough there is ferrite in that boot - see pic. I hadn’t realised it when I removed it, but the ferrite was in pieces - broken - inside the boot. You can see where the wires were coiled around the ferrite which was round. This from my circa 2004 early model. We will if you’re prepared to be the guinea pig! Paul, my guess would be, as commented in an earlier post in this thread, that the ferrites in the cable are most likely there to stop car generated noise coming up the power leads into the rig. If you are not using the FT857D connected to a cars supply, you should be fine to remove the ferrites as well as the Molex connector and replace it with something smaller such as Anderson power poles. Today I found my cut plug and found a ferrite core in it. I then remembered why I attached another ferrite core to the cable after cutting the OEM plug. Meanwhile, you already posted a pic of the ferrite. Anyway, can’t say if the ferrite is any good. I didn’t notice any diference w/ or without a ferrite on the cable. Seems, ferrite core(s) on the mic line are much more important. Seems, ferrite core(s) on the mic line are much more important. You need more EIRP, Brian. You mean a less efficient antenna? He’s suggesting your ability to disturb the aether is not strong enough to cause issues in the shack. You need to either replace the damp string you have now with something better or get a burner so you’ve got more poundage. Or both. Preferably both! Indeed, and I was gently suggesting that his RF in the mike lead problems arise from an inefficient antenna and/or radiation from the feeder adjacent to the rig! Thinking about it, on my occasional 80/60/40m activations I use a W3EDP at up to 100 watts with a 1 metre patch lead to the tuner and the counterpoise running near the rig and I have no problems, similarly on 20m and above I run a more beefy copy of your three band antenna with no problems. I use my FT857 as a base station – it’s a fine rig and I particularly like the DSP CW filter in weak/noisy conditions going down to 60Hz. But given its size and weight (2.2kg) it wouldn’t be my first choice for SOTA activating. For folk on a budget, you take the rig you have – no argument there. I’m lucky enough to afford several rigs. Phil, I’m sure you blogged somewhere that you have a KX2 and a VHF/UHF H/H (as I do) so I’m wondering why you would carry the 857 instead. Am I missing a trick here? Is it the extra power for SSB? 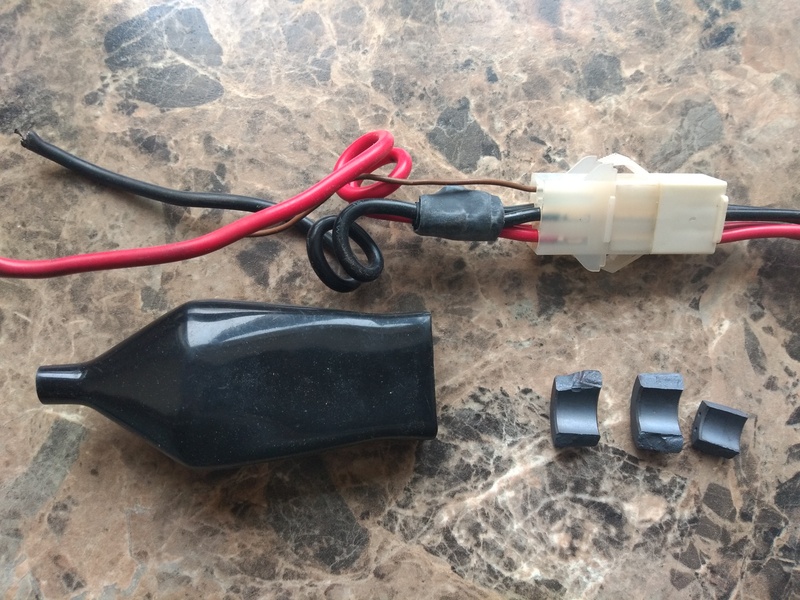 Keen users of the popular half-wave end fed antenna system will want to remove any chokes on the power leads so that their battery connections can make a full contribution to their radiating system (!). I persuaded the toroid to emerge from mine. 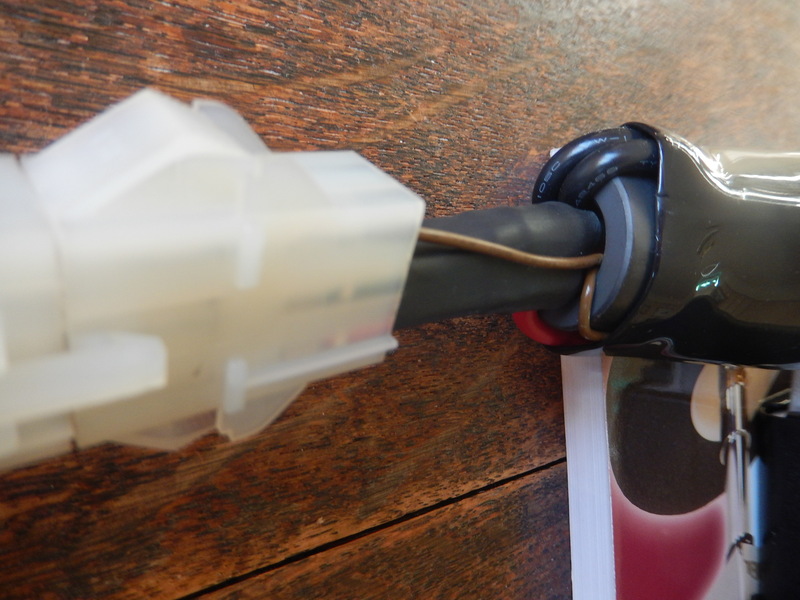 Also showing the brown lead and the same doubled up cable to reduce the pin current in the connector. Yes Andy, you have it right. Horses for courses. I take my pick depending of where the summit is and how far you have to hump the kit. VHF is easy and quick but as you know only effective in certain parts of the UK. So for HF I have the choice of FT-857, KX2 or HB1B (CW only with that one). That day my friend Geoff needed SSB so as insurance I carried the FT-857. It wasn’t far to walk. See my blog. Good photo that Rod - glad to see your ferrite is still intact! My FT-857d was purchased in USA 12 years ago. It has no filters on the power line. On sota I use mostly end fed 1/2 wave antenna on 20m. The computer I have used for many FT8/JT-65 activations crashes when I transmit using more than 5 watts. I have therefore put a common mode filter on the coax connecting the radio to the 1/64 unun that I use to match the antenna. I have not tested that combination yet. Seems to me that ferrites on different leads must be EU thing. In my Kenwood TS-480SAT manual’s “what’s in a box”, “installation” and similar sections there are ferrites shown, but with remark “*E-type only”. I am a late entry to this thread but these are my thoughts. I have an 857 and the first job I undertook in preparing it for hill use was to remove the black sheath, plug and ferrites and coil up the nice brown wire.The rig is still heavy! So what may the ferrites be there for? To stop RF from entering the environment in a vehicle or switch mode PSU situation. These do not concern SOTA. To stop radiated RF re-entering the radio via the power leads. This could be a significant SOTA issue and although we generally use power leads that are only a fraction of a wavelength long, we sit close to the aerial. I am aware of an 875 that was destroyed last year on a Special Event by this feedback, when used to feed an iffy end-fed. Cut off the DC lead appendages. Fit good plugs capable of carrying 30Amp min. Feel better that your rucksack is now a little lighter. Fit fuses close to the battery to protect the battery from cable and rig short CCT failure. If possible use an RF sniffer to make sure that the feeder is not part of the radiating system, carrying current on the outside of the screen.